1. I had one of the best things EVER the other morning. 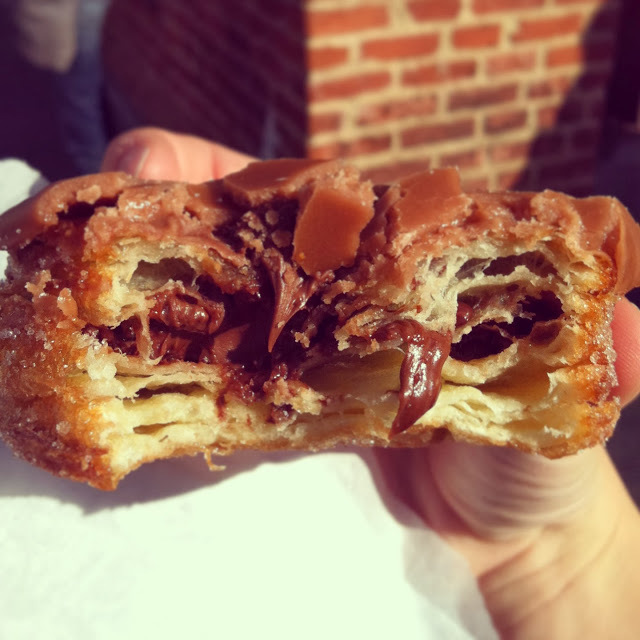 A nutella cronut. It was filled with nutella and was utterly delicious. I know it’s not from the original cronut place, but that doesn’t mean that it wasn’t incredibly good. I’ve been dreaming about it ever since. 2. I went to the Disney opening of Saving Mr. Banks and the movie was incredible! SO good. 3. I haven’t done any Christmas shopping yet because I can’t believe it’s December 12. Seriously though people. When did this happen? 4. I love Scandal, so seeing this drinking game for the mid season finale made me laugh. And keeping with Liv’s drinking, I’m sure it must be played with wine. 5. I don’t know if I’ve ever had bourbon but part of me is obsessed with it. I blame things like these bourbon salted caramels. They just sound SO GOOD. 6. I went to Georgetown Cupcakes for the first time yesterday. Salted caramel and the chocolate eggnog? Delicious. I need to figure out how to recreate them. 7. How incredible does this hot chocolate look? I want it. 8. And because I don’t love her blog enough, I want to make these mason jar crafts. The glitter just makes me so happy. 9. By next weeks Thursday Things I will be in NJ! I can’t WAIT! !